There’s little in life more comforting than a grilled cheese sandwich. We can appreciate the simplicity of a nice classic grilled cheese, served alongside a steaming hot bowl of tomato soup, as much as anyone. But, we also love to kick things up a notch and play around with new flavor combinations. This grilled cheese, which we created in celebration of Grilled Cheese Month, was the product of some of that creative experimentation. As we shuffled through the freezer last weekend, we came upon a stash of truffle butter we’d whipped together last fall when black truffles went on sale at a local gourmet grocer (and yes, it's the same butter we used for that amazing truffle butter popcorn... So. Good.). When we opened the fridge, we noticed that we also happened to have a small bowl of mushroom duxelle in the refrigerator, left over from a recipe we’d made the weekend before. Peef was hungry for grilled cheese. And that’s when inspiration hit. Fortunately for us, something magic happens when you combine the earthy flavors of truffle butter and a simple mushroom duxelle with the creamy nuttiness of melted fontina. I swear there was singing. And sunshine. And… well, you get the point. This was the sort of sandwich that’s right up our aisle. A little bit fancy, but not too fussy. And best of all, it was delicious. 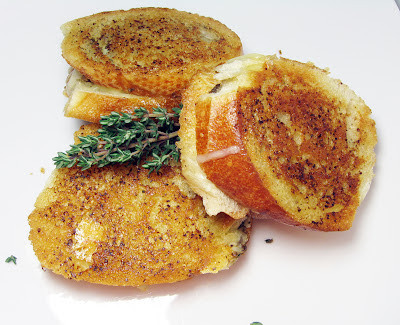 Serve these mini grilled cheese sandwiches to friends at your next cocktail party. Or make them for yourself and take the time to relish one of life’s little indulgences. You can find this recipe, along with plenty of other mouthwatering dishes, on GoBoldWithButter.com Seriously -- you should check it out. So. Much. Good. Food. One of our very favorite preservation techniques is compound butter. It is a snap to make, and is a most excellent way to preserve the fleeting flavor of even the most transient of seasonal items, such as ramps, green garlic, or wild mushrooms. It also happens to be a brilliant way to make the most of expensive or unique items. 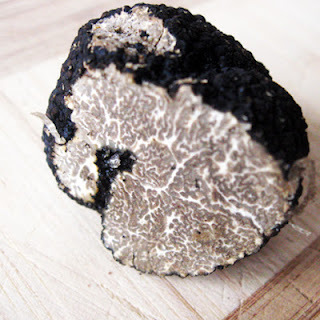 Take for instance, the humble truffle. We won’t lie. if you’ve never eaten a truffle before, we are prepared to go on record saying that they are as good as people say they are, probably better. They are, in fact, one of the best things we have ever ingested -- earthy, nutty, and distinctively rich. They shine in almost every application. And now that we’ve partaken in their incredible earthy flavor, we lust after them at every turn. But, truffles are also undeniably expensive. So, what if we told you there was a way to take just a scant ounce or two of those deliciously earthy delights, and transform them into a virtual bounty of delicate truffle flavor? That you could enjoy those truffles all year long -- over pasta, rice, eggs, steamed vegetables, grilled steak, or a simple slice of toasted country bread? Enter truffle compound butter. You’ll love its versatility and the way it delicately flavors even the humblest of dishes with its woodsy flavor. It takes just minutes to make, and the finished butter will last for at least six months if kept in the freezer. Best of all, one small truffle and a pound of butter gives you meal after meal of delicious truffle flavor. 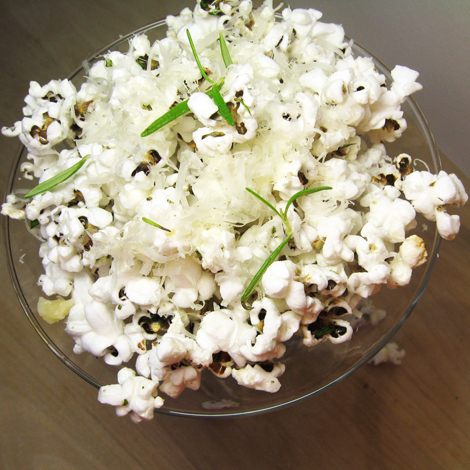 And while you’re making truffle butter, why not try this delicious popcorn? It’s perfect fancy date night fare, especially when served alongside your favorite movie with a tall glass of sparkling wine. At our house, weekday breakfast generally consists of a smoothie made from yogurt and fruit. We seldom have time to linger over our coffee, engage in polite conversation, or spend time cooking up morning treats. So, we take our smoothies to go in stainless mugs. And most of the time we pick up our coffee at the office. But, things are different on the weekend. At our humble abode, weekend mornings are slow and somewhat lazy. They are days when we have time to enjoy long walks around the dewy neighborhood, piping hot cups of cabin coffee, fat newspapers, and deliciously indulgent breakfasts. Sometimes that means sitting down to a full plate of eggs, sausages and toast. 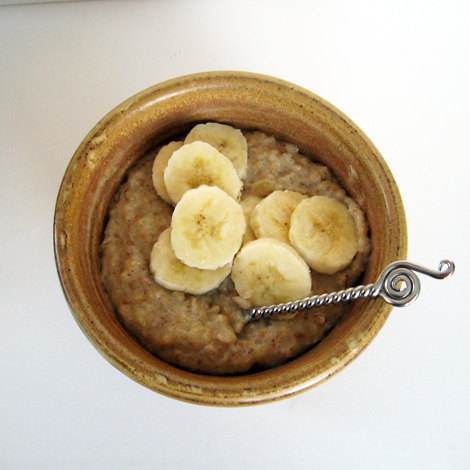 Other times, it means enjoying something as simple as a steeping hot bowl of deliciously filling oatmeal. This oatmeal is ideal for just that sort of weekend morning – when you have a bit of time to let the oatmeal cook while you spend your time putting on a pot of coffee and watching butter turn from a delicious golden to a nutty brown. You’ll love the way the sweetness of the bananas play off of the nutty oats and complement the deep caramel tones of browned butter and brown sugar. It’s the sort of breakfast that brings together the heartiness of stick-to-your-ribs grains with a subtle sweetness that makes breakfast feel like a treat. And, on the weekend, what more can you really ask for? Ham may be classic Easter fare, but that doesn’t mean it has to be boring. 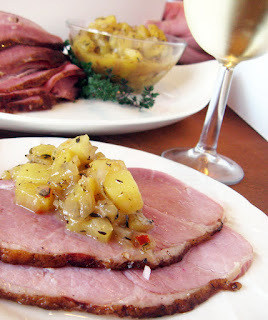 This recipe is an inventive twist on the classic ham with pineapple that your guests will adore. And you’ll love the ease with which it comes together. 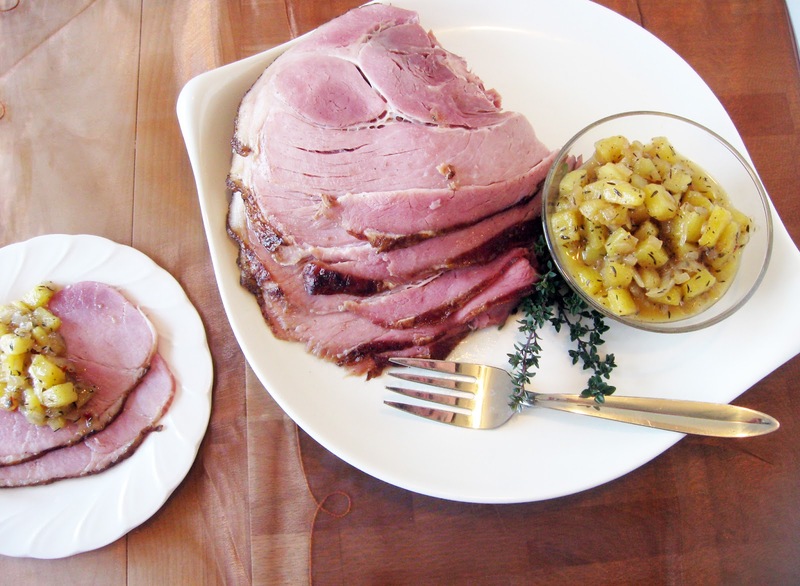 Spiral sliced ham is a boon for anyone throwing a large Easter gathering. Not only is every slice the same thickness but, if cooked properly, the ham will be tender and juicy and require nothing more than a horizontal cut to the bone before serving. The trouble with spiral sliced hams is that, because they’re already precooked, it’s easy to dry them out while reheating. This recipe makes use of the slow cooker, which ensures a moist, tender ham while freeing up your oven for all those delicious Easter side dishes. Even better, you’ll impress your guests when you serve up slices of moist, hot ham topped off with a delicious sweet & sour pineapple chutney. In the chutney, which can be made 2 days ahead, lime juice stands in for the usual vinegar, imparting a fruity tang that’s complimented by the subtle flavors of rum and allspice and the savory herbal notes of thyme. This recipe is based on the use of a spiral sliced half ham. Be sure to buy a ham that fits in your slow cooker. An oblong 6 ½ quart model is ideal for an average sized half ham. 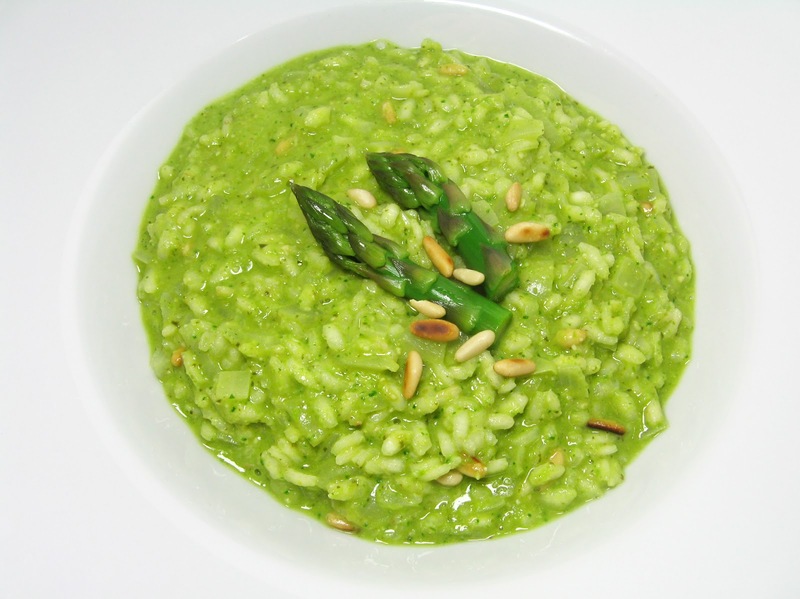 Easter Dishes: Spring Risotto with Asparagus "Pesto"
I've got a thing for risotto. And it's not just because it's so creamy and delicious. That's part of it, of course. But, I also appreciate its versatility. Throw anything in with a bit of stock and some arborio rice, and you can call it dinner. Some people complain that risotto takes such a long time to make. And they whine about how it requires so much stirring. But, that's another thing I love about it. I love watching the rice toast in the oil. I love how you can see it absorbing the liquid -- first the wine, and then the stock. I love how the grains turn from firm to creamy, almost before your very eyes. And the stirring -- well, that's sort of like meditation. I particularly love risotto in the springtime when I have a wealth of new vegetables and fresh herbs to choose from. Like asparagus. The asparagus pesto in this dish is made in the same manner as a more traditional basil pesto. Blanched asparagus is pureed with garlic, Romano cheese, toasted pine nuts and olive oil, along with a bit of spinach to intensify its bright green color. Lemon juice is added to pull the flavors together and add a pleasant brightness to the finished pesto. 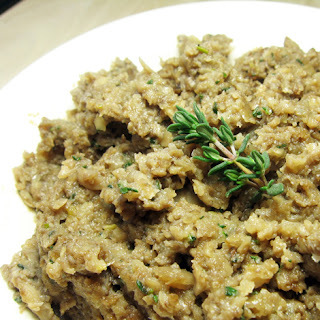 This delicious spring risotto makes an excellent vegetarian main course or side dish which can be served with a variety of roasted or grilled meats. Leftover asparagus pesto is delicious tossed with cooked pasta, spread on grilled cheese sandwiches, or stirred into potato soup. Even the leftover risotto is delicious. Dish it up into a bright colored bowl and eat it right out on the patio, alongside the daffodils, while sipping a glass of delicious Savignon Blanc. 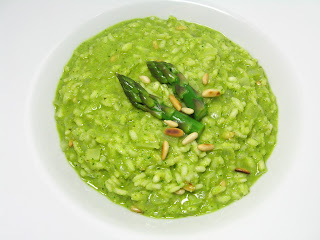 Spring Risotto with Asparagus "Pesto"
I think it’s a shame that side dishes are so often overlooked at the holiday table. We spend all of our time obsessing over perfecting our roasted turkey, getting the perfect crust on our rib roast, or stunning our guests with the most tender and flavorful ham. Meanwhile, we settle for the same old sides – mashed potatoes, steamed vegetables, and blah heat-and-serve dinner rolls. The perception is that truly great side dishes take a wealth of time. But, the fact of the matter is, many of the most delicious dishes require only a few high quality ingredients, and just minutes of preparation time. 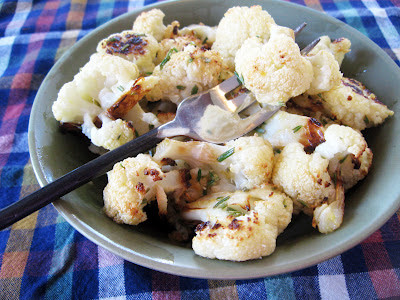 Take, for instance, this stunning roasted cauliflower dish. Roasting isn't usually the first cooking method you’d think of for cauliflower, but the delicious results make it worth remembering. There is something magical that happens when cauliflower is tossed with oil and roasted in high dry heat. Its sugars caramelize and a deep browning occurs that results in a deliciously nutty flavor. 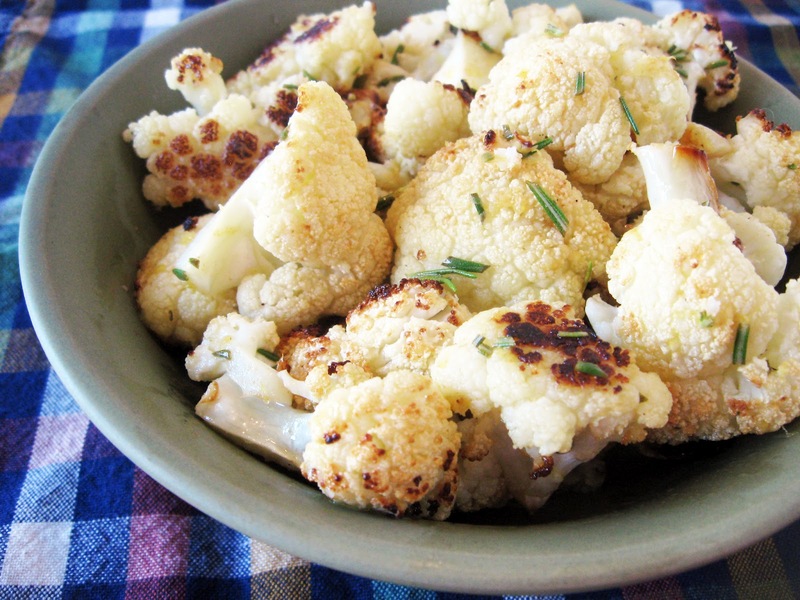 Paired with the woodsy aroma of fresh rosemary, the nuttiness of browned butter, and the pleasing acidity of fresh lemon juice, this simple side dish will be the star of your Easter table.